Just in time for the holidays, Sotheby’s final jewellery auction of the fall season will be held in New York on 9 December 2015. A number of treasures will be auctioned in a sale which will offer more than 500 lots with estimates starting at $5,000. Perfect timing to pick up your Christmas gift? If these jewels could talk, what a tale they would tell: an iconic Art Deco diamond necklace made in 1939 by Van Cleef & Arpels for Queen Nazli of Egypt, and an avant-garde creation made by designer Suzanne Belperron circa 1935 for Wallis Simpson, the Duchess of Windsor for whom King Edward VIII gave up his throne. The rare combination of superb original design with romantic provenance is irresistible to lovers of fine jewels, and we are thrilled to present them to collectors this December. 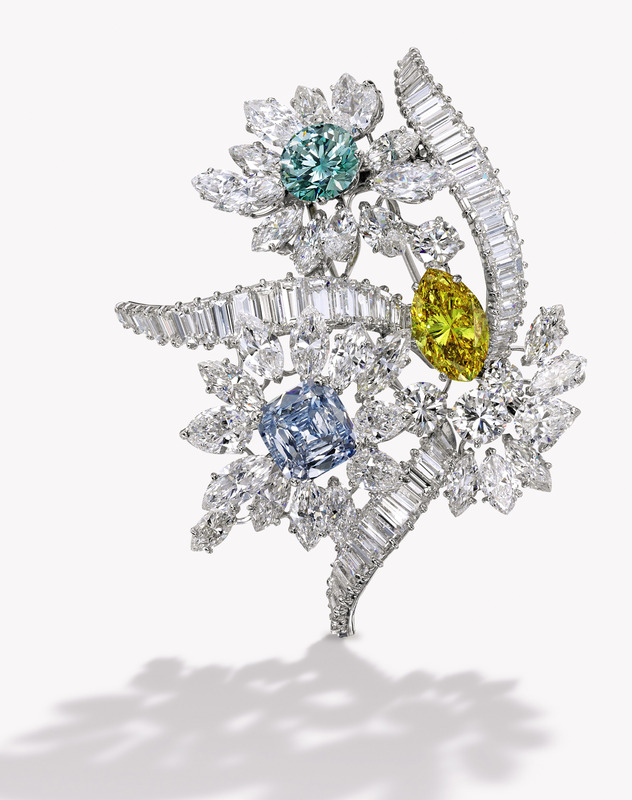 Here are the fabulous highlights of Sotheby’s Magnificent Jewels auction. Magnificent and Historic Platinum and Diamond Necklace, Van Cleef & Arpels (estimate $3.6/4.6 million), created by the Parisian jeweler in 1939 for Queen Nazli of Egypt. Set with 217 carats of diamonds in a sunburst motif, the sensational bib-style necklace has been called ‘a perfect piece of jewelry’ by Vincent Meylan, author of Van Cleef & Arpels: Treasures and Legends. Elegant and Rare Platinum, Aquamarine, Sapphire and Diamond Sautoir, Cartier, London. The pendant suspending three variously-cut aquamarines, the rectangular-shaped aquamarine weighing approximately 29.00 carats, supporting an octagonal-shaped aquamarine weighing approximately 54.20 carats, terminating in a pear-shaped biolette-cut aquamarine drop weighing approximately 59.30 carats, spaced by geometric links decorated with cabochon sapphires weighing approximately 5.30 carats, completed by the original silk cord applied with diamond-set accents, the round and single-cut diamonds weighing approximately 1.15 carats, necklace length 30 5/8 inches, pendant length 4¼ inches, unsigned; 1929. Estimate: $450-550,000. Three superb rings. Important 18 Karat White Gold, Sapphire and Diamond Ring Centering a cushion-cut sapphire weighing 9.11 carats, flanked by two cushion-cut diamonds weighing 1.06 and 1.01 carats, size 6. Estimate: $750-1,000,000. Platinum and Diamond Ring, Cartier Centering a cushion-cut diamond weighing 15.04 carats, flanked by diamond-set rows, the round diamonds weighing approximately 1.25 carats, size 8, signed Cartier, numbered 891956. With signed box. Estimate: $700-900,000. Platinum, 18 Karat Rose Gold, Padparadscha Sapphire and Diamond Ring Centering a cushion-cut padparadscha sapphire weighing 9.12 carats, flanked by trapeze-cut diamonds weighing approximately 1.05 carats, size 5¾. Estimate: $100-150,000. Two ‘Drape’ Bracelets by Schlumberger, one lapis lazuli, turquoise and colored diamond, the other coral and diamond, (estimates $20/30,000 each) formerly from the collection of Mrs. Paul Mellon. Mrs. Mellon was known to be a patron of Jean Schlumberger’s jewels and much of her Schlumberger jewelry collection was bequeathed to The Virginia Museum of Fine Arts last year. Highly Important Pair of Emerald and Diamond Earrings (estimate $1.8/2.2 million) are set with Classic Colombian emeralds. Known as The Stars of Muzo, the impressive emeralds weighing 22.97 and 21.37 carats are accompanied by two gemological reports stating the stones are unenhanced. These exceptionally rare emeralds are accented by more than 5 carats of D color, Internally Flawless diamonds. Centering a pear-shaped Fancy Pink diamond weighing 6.93 carats, VS1 clarity, flanked by two pear-shaped near colorless diamonds weighing approximately 2.10 carats, size 5¼. The double-fluted cuff-bracelets composed of carved chalcedony in the form of stylized crowns, bordered by 14 chalcedony beads, each bead topped by a cabochon sapphire, further decorated by old European-cut diamonds weighing approximately 2.80 carats, internal circumference 6 and 5¾ inches; 1932-1937. With fitted box. Estimate: $400-600,000. Another view of Queen Nazli’s necklace by Van Cleef & Arpels. A large part of Nazli’s jewelry collection, including her Van Cleef & Arpels diamond necklace and tiara, was sold by Sotheby Parke Bernet in New York in November 1975. The diamond necklace has since remained in a private collection for 40 years, and is to be sold this December for the benefit of a charitable foundation. The Belperron Chalcedony suite once belonging to the Duchess of Windsor. Queen Nazli (1894-1978), mother of Egypt’s King Farouk, commissioned the diamond necklace and a matching tiara for the wedding ceremony of her daughter, Princess Fawzia, to the Crown Prince of Iran, Mohammad Reza Pahlavi, in 1939. Post edited by Claudia Carletti, Jewellery Through Time. All material courtesy of Sotheby’s.